Today I’m going to tell you about a product called ADAPTIL® for dogs designed to reduce a dog’s anxiety using dog appeasing pheromones. 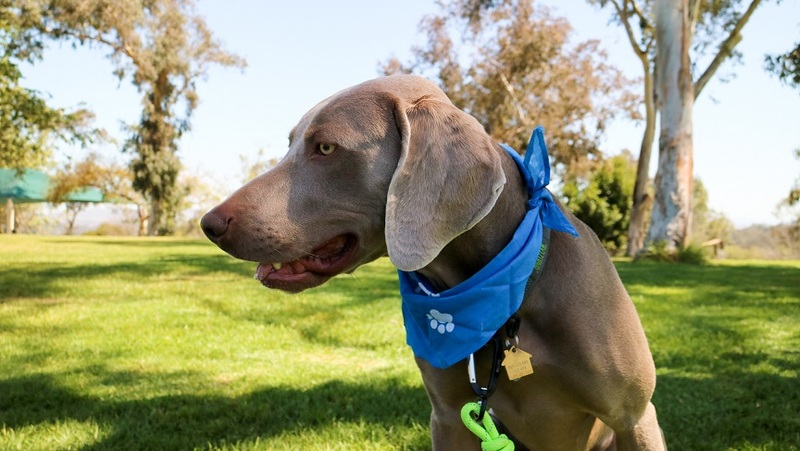 The product can help a dog feel comfortable in stressful situations. I’ll also tell you about a related product for cats that our vet suggested for my cat Scout. I’m lucky my two dogs Ace and Remy are not nervous or afraid of thunderstorms, fireworks or being left alone. But these types of “events” are common reasons for a lot of dogs to feel anxious or stressed out. My dogs do tend to get nervous when visiting the vet or when we travel. They whine and pant and you can see the excitement and nervousness in their faces. I’m sure many of you can relate! This post is sponsored by Ceva Animal Health, the maker of ADAPTIL® for dogs and FELIWAY® for cats. If you are interested in trying either of these products for your pets, we have a giveaway at the end of this post. Both products are available without a prescription through various veterinarians’ offices and through PetSmart and Amazon. Ceva Animal Health said that ADAPTIL® mimics the natural dog-appeasing pheromone dogs know from birth that can help them feel safe and secure in their environment. Read more about ADAPTIL® here. Pheromones are chemicals produced and released into the environment by animals. They work outside the body and can affect the behavior of others of its species. 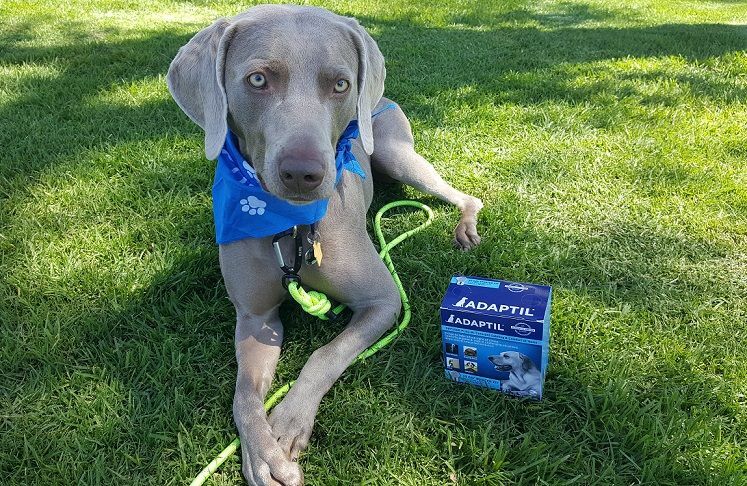 ADAPTIL® is designed to help dogs feel more secure and should reduce or stop stress-related behaviors such as licking, trembling, barking, howling, destroying property or having accidents. Ceva Animal Health said ADAPTIL® is non-sedating and is not a drug. It is safe to use with all other treatments or conditions, and a prescription is not required. 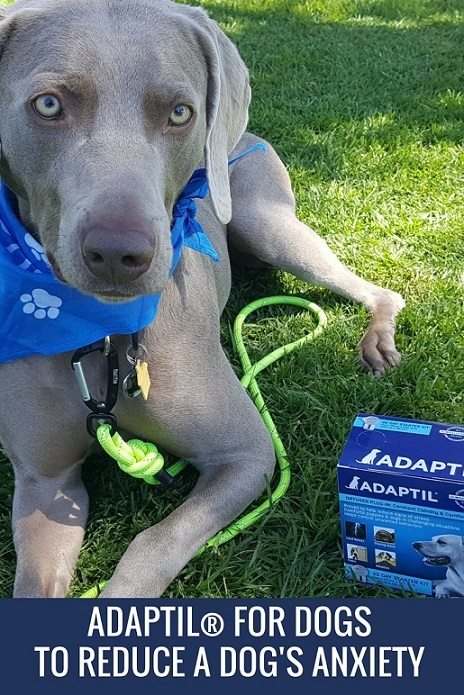 ADAPTIL® collar – good for travel, walks, training classes, etc. ADAPTIL® diffuser – best for use at home for newly adopted dogs, separation anxiety or fear of visitors, storms, fireworks, etc. 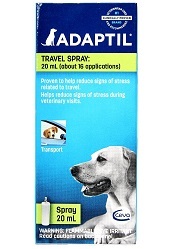 ADAPTIL® is available through various veterinarians’ offices, PetSmart and Amazon (aff links above). 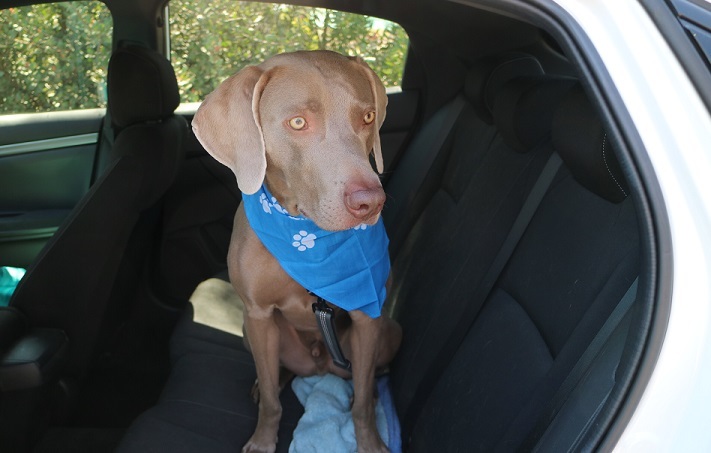 My dogs tend to get anxious in the car, so I recently used the ADAPTIL® spray on bandanas that they wore on a road trip. They do not have extreme anxiety, but it seemed to help them settle in during our 3-hour drive. My cat Scout, on the other hand, can be a nervous wreck! The first time I heard about ADAPTIL® and FELIWAY® was actually through our vet. 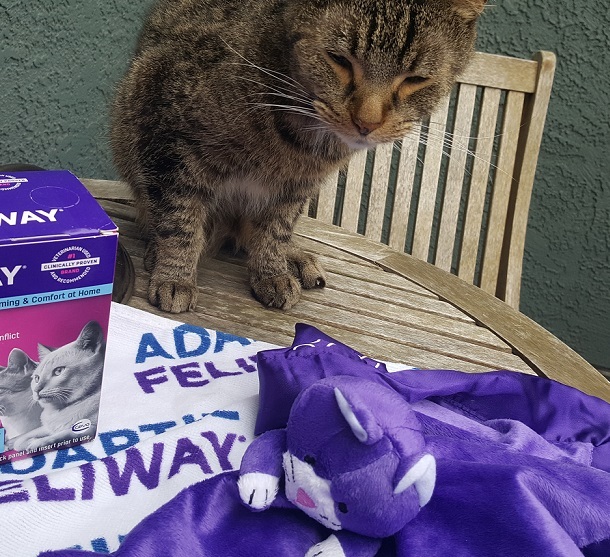 He recommended FELIWAY® for Scout. My cat Scout is so afraid at the vet that he will hiss, bite and scratch when he feels threatened. It’s stressful for everyone when Scout visits the vet! So much so that for a few years I just didn’t take him to the vet because it wasn’t worth the stress. Because of Scout’s extreme fear, our vet gave us the FELIWAY® spray to help our cat feel more secure. Read more about FELIWAY® here. 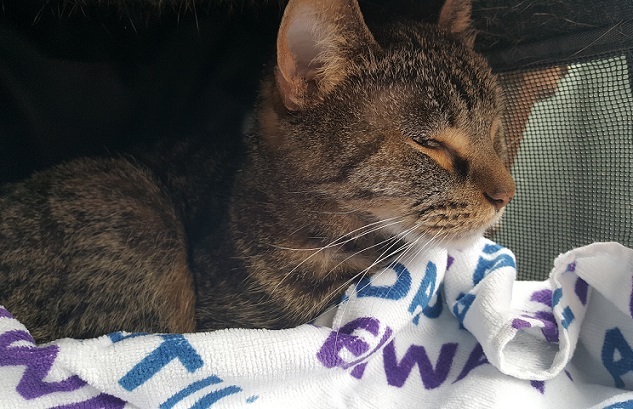 To help Scout feel safer at the vet, we put the FELIWAY® spray on a towel in his cat carrier before we arrived at the vet. We also sprayed it on a towel that we placed over his carrier. The combination of FELIWAY® and a seriously patient vet helps Scout feel secure enough that he no longer shows aggression. He is quiet and tense, but no hissing or biting. I never thought that would be possible with my little psycho! 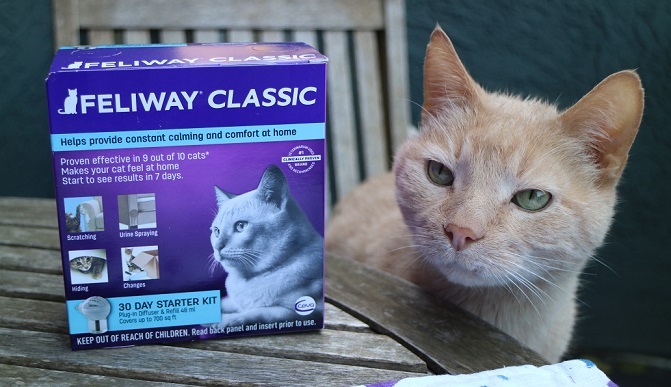 FELIWAY® is available through vets’ offices, PetSmart and Amazon (aff links above). April is actually De-Stress Your Pet Month, and Ceva Animal Health is giving away a sample of ADAPTIL® or FELIWAY® to two readers of That Mutt. On Tuesday May 1, I’ll choose the two winners at random. Must have a U.S. mailing address to win. I’ll notify the winners by email first and then announce them here. Do you have any questions about ADAPTIL® or FELIWAY®? Let me know in the comments, and please share this post if it will help a pet you know. Thank you! I will have to give this a try. My dog has super anxiety with almost everything. Our dog baby has a ton of energy and has difficulty with other dogs and is overly excited when anyone comes to the house. We have tried many different methods to calm her but so far we’ve relied on keeping her on a leash and tons of exercise before guests arrive. I want her to feel safe and secure when other dogs are near or people come visit. My 2 year old dog Sadie is anxious in the car and also a gets skittish when she hears loud noises on her walk. I feel so badly that she is stressed. Would love to try to get her to chill out. I would love to try this with Tug for his dog anxiety. I would love to try Adaptil on Bo who has doggie anxiety when it comes to storms, fireworks and strangers. My Vet and staff have attended a stress free workshop and have this diffuser in all of their exam rooms and lobby. Unfortunately, this doesn’t help my Minnie,my rescue, who has panic attacks going and visiting our Vet. I do think the collar would work better. My Noah had terrible separation anxiety as a puppy when I was at work and ate pieces out of every piece of wood furniture in my den! When I finally asked my Vet about this problem, she explained Separation Anxiety but didn’t have an answer 8 years ago. Thanks for the article. My furbaby dog “OSO” has some anxiety issues that this might help alleviate!? Hope we win! My dog Yoli is not good around strangers at all. Barks and charges at them. No one can really come over or approach us on walks. She is a rescue cattle dog. I am desparate to try anything to get her to be more friendly. She really is a sweet girl once she knows you awhile. I am curious about these products for I have seen them at the pet stores and online and the online reviews seemed pretty good. Thank you for this useful info. Cats and dogs are living in the house and some of them are stressed from one another. One dog was rescued and has been anxious from the start and one cat is very territorial. I do not expect these products will cure all issues but it may alleviate the situations. My poor Sadie really would benefit from Adaptil. She was a rescue dog and is very anxious when someone strange comes in the house and out in social situations. Thank you for the opportunity to win a sample. I would love to try this for Colby, he has separation anxiety and now has anxiety around new dogs at daycare. He’s kind of a hot mess. Would love to try this on my 5 month old puppy. He has hard time when I leave the house. Hi! I do enjoy reading your blogs and advice! I have tried the adaptil collar on my 2 yr old chocolate lab but didnt notice much difference. She has seperation anxiety and would love to try this product! After reading these comments I feel like louie is less anxious than I thought. He does hide under the couch though if the upatties neighbor makes loud noises. Everyday type noises. His anxiety doesn’t last too long but it is unsettling. Is love to try Adaptil. Thank you for reading. I can relate to the traveling part with my dog now. I wish this was out when my other dog was alive. He did not travel well at all. Was very nervous. Right now my dog gets like yours do. This would be great on a lengthy ride. Adaptil sounds perfect for my baby! He’s a year and a half and a nervous 8 lbs. of pure Maltese energy, and not the good kind! He barks at every tv commercial, people walking outside our townhouse, in the car (oh boy!) and on walks. Matter of fact, he’s barking right now at a bird chirping outside! My doggie, myself and my whole family need Adaptil! I bet the collar would work very well on him. My grand dog Tuff sure could use these. He is afraid of thunder, fireworks and even when the smoke detector goes off by accident. We would LOVE to try this. Sasha is a hot mess in her crate during competitions and I’ve been looking for something for her to be able to calm down. Kodiak is developing more anxiety with noises as he grows older, especially fireworks and storms. His anxiety also keeps us from taking him places and around people as we are unsure as to how he will react. A visit to the vet is also a dreaded event. Adaptil might be a big help for a big bundle of nerves. I would love to try this on my four year old rescue dog Molly. She has severe separation anxiety and this might help. Nothing has worked so far. Would love to try this product as I just adopwd Marley from a rescue and he has separation anxiety. He bit be once already and we are training him so that he understands that I will not leave him and that everything is fine. He’s pretty smart and has stopped crying but still gets possessive about toys and his bed. My little dog Dobby cannot control his excitement and noise levels when I get home or visitors arrive and it causes absolute chaos, getting my other two dogs hyped up. Our new neighbours let off very loud fireworks on new years eve that continued for over an hour and got him into an extremely stressed state to the point that I was concerned about his health. He now gets extremely anxious if I am out in the garden after dark or if there is any distant banging noise or door slamming and is inconsolable. I have tried everything suggested but nothing seems to help calm him once it is set off. I would love this to be “the magic formula” that helps him. My dog has anxiety issue and has taken to bite our hands to get calmer. We are working with a behavioral therapist, but our hands would be thankful if something could also help calm him down…. My pups Toby and Feeny are both rescues and tend to get extremely nervous whenever we leave to go to work or have people over. Our vet mentioned trying an anxiety reducer but I’d like to try something gentle and drug free first. 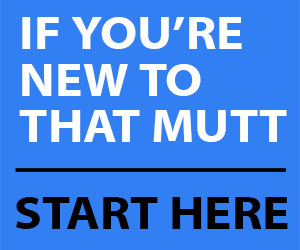 Has anyone had luck with adaptil working for their nervous dogs? A sample to try would be great! My Cody loves new people and having the windows open in the car but too much and he definitely gets stressed out. He’s not a fan of crowds or the vet either, which is tiresome because we go monthly to the vet because his allergies and fits during nail clippings. Adaptil seems like one of those “too good to be true” but the results really make the difference. The spray and collar would make it super simple right before the vet and until we get home. Peace and love! Steel doesn’t like loud noises. She hates the ones she can feel. When the college fires a cannon when the football team scores and when fireworks go off, she’s a mess. If we win, we would love to try the ADAPTIL® diffuser. I just recently got a new pup and so far the only thing that seems to upset her is a pending thunderstorm. It’s must be the smell because she gets nervous before the thunder and lighting begin in our area. If we are lucky enough win, we would like to try the ADAPTIL® diffuser. Molimo is skittish around new people. She needs her safety net. I wonder if the ADAPTIL® diffuser could help her expand that safety zone when times are tough for her. I have recently taken on a gsd rehome. She suffers anxiety about being confined and seperation and men. I think she would benefit hugely from this so maybe she could stop destroying my house/crates/kennel/you get the idea! Houston, my rescue GSD/hound suffers during storms and fireworks. For reasons I’ll ndver understand, there are tons of fireworks in my neighborhood. It’s a nightmare. I would love to try this for Maddox since his rescue a year ago he has come a long way. Unfortunately he is still very fearful with new people and new places. He shows this with shaking and barking I would love to help him see there is nothing to fear. It makes me sad he is so scared I want to help him overcome it. I have an older foster beagle, with CHF. She has blended quite well into our pack of 3, we plan on letting her live her life out here with us. The only issue she has is separation anxiety, which has become worse as she gets more attached to me. I have tried the comfort shirt which only makes her hot. I would love to try this to see if it helps her. Our new guy Max reacts to EVERYTHING..poor guy. I would have thought since he came from the city, he’d be used to noise. We live in the country and everything sets him off. The wildlife even get him going. He also has separation anxiety so badly he does poop in the house (he’s getting better and the poor guy try’s hard but his anxiety gets the best of him and he can’t help it ). We are going to get something to help him calm down so, this would be perfect to be able to try to see if it helps our poor guy. This would be amazing for my dog Doc! We recently moved and he’s still unsure about his new home and gets bad anxiety whenever I grab my keys to leave. I hope this will help him adjust quickly! I would love to give this a shot with my dog Rose! She can be very anxious in the car and at training classes. Thank you!